*The sell-off of Vox's properties around the Northeast continued last week, as Bruce Danziger and Jeff Shapiro's group filed to sell most of its stations in Glens Falls, NEW YORK to Jim Morrell's Pamal group. Even as Vox has been selling off many of its stations in the region (the Pioneer Valley to Saga, Concord to Nassau), Pamal has been busy expanding, adding stations in Springfield and Westchester - and now, for $2.5 million, Vox's sports WMML (1230 Glens Falls), standards WENU (1410 South Glens Falls)/WENU-FM (101.7 Hudson Falls) and country WFFG (107.1 Corinth). Meanwhile up in Glens Falls, Pamal will add its four new purchases to its existing station in the region, modern AC WKBE (100.3 Warrensburg) - and the whole market will be down to just two players, Pamal and Entertronics (WWSC 1450 Glens Falls, WCQL 95.9 Queensbury and WCKM 98.5 Lake George). And before we leave Albany behind, we hear listeners there will begin hearing announcements today promoting a frequency swap to take place next week: on March 1, the religious programming now heard on WDCD (96.7 Clifton Park) will move to 1540 Albany, while the WPTR calls and oldies "Legends" format will move from 1540 to 96.7. This will be the second go-round for WDCD on 1540; Crawford Broadcasting simulcast its religious programming on the AM side for several years before launching "Legends" there. In Syracuse, WSYR (570) has a new news director to replace Bill Carey, who's now at crosstown competitors News 10 Now and WFBL (1390). Dave Bullard comes to WSYR from the "Fulton Daily News" website and its companion sites serving Oswego and Baldwinsville; he'll remain involved in those sites and their reporters will begin contributing material to WSYR. Here in Rochester, we mourn the passing of Bill Klein, the entertainment reporter who spent 38 years entertaining the region, first on WVOR (100.5) and later on WHAM (1180), where he was a fixture on the morning show. "The Klein" was particularly well loved for his annual Oscars party, which several years ago outgrew its original home at the George Eastman House and now takes over an entire movie theater every year. Klein collapsed before an appearance at the University of Rochester Wednesday morning (Jan. 18); he was only 60. His Oscar party will go on as scheduled next Sunday, with proceeds (as always) benefiting WHAM's "Heart of Gold Childrens' Foundation." Another voice disappeared from WHAM as well last week, albeit with far less impact on the community. Joe Pagliarulo, who'd been doing the 11 AM-2 PM talk shift formerly occupied by Bob Lonsberry, told listeners at the end of Friday's show that it was his last for now. "Joe Pags," who's also the weeknight anchor for WRGB (Channel 6) and weekend talk host for WGY (810) in Schenectady, had been doing the show mostly via an ISDN hookup from Albany. WHAM's not saying who the talk slot's next occupant will be...stay tuned later today on NERW for the latest. How slow was the broadcasting beat downstate? So slow that the Daily News ended up leading its radio column on Saturday with none other than the Tower Site Calendar 2004. (Not that we mind...thanks, David Hinckley!) There was this, at least - the Jets have re-signed with WABC (770) and WEPN (1050) to carry their games next season. *Things were hopping in central PENNSYLVANIA last week, at least, as Harrisburg listeners said goodbye to "Cat Country" WCAT-FM (106.7 Hershey) - and, after several long days of a loop of "Pop Goes the Weasel", said hello to something called "Cool Pop" under the calls WCPP. What's a "Cool Pop"? Like "Jack" up in Canada - or the late "Blink" in New York, for that matter - it's hard to pin down to a traditional format label. We've heard it described as everything from hot AC to top 40/pop, and it sounds to us (based on the playlists we've seen) like a cross between the two, apparently with a healthy Blink-like dose of celebrity news and gossip to be mixed in. The only air talent on board so far are former Cat morning team Michelle Cruz and Dennis Mitchell ("Michelle and Mitchell"); at the helm of programming is Claudine DeLorenzo, who's been promoted from PD of sister stations WQXA-FM and WRKZ to director of programming for the entire Citadel/Harrisburg cluster. One more WCAT-FM note: former 106.7 overnight host/music director Gwyneth "Dandalion" Seese has filed an age discrimination lawsuit against Citadel. Seese, a 23-year veteran of the station, was 64 when she lost her job there in June 2002. Over in St. Mary's, Dennis Heindl's WDDH (97.5) is sold to Michael Stapleford's Magnum Broadcasting; no word on whether any changes are planned to the country format at "The Hound." In Pittsburgh, Sal Patitucci's "Radio Italia" has a new home: it's now heard weekdays at 5 PM and Sundays at 1 PM on WKFB (770 Jeannette) after many years at WEDO (810 McKeesport). And in the State College market, WGMR (101.1 Tyrone) has moved from modern rock to top 40, still calling itself "the Revolution." *One DELAWARE note: WAMS (1260 Newark) has changed calls again - this time to WNWK. We hear it's been running a satellite soft AC format. *One NEW JERSEY note, too: Darrin Smith has resigned as PD of WHTG-FM (106.3 Eatontown); he'll stick around into next month as a replacement is found. *More bad news for VERMONT's best-known unlicensed broadcaster: Vermont's U.S. attorney has filed a lawsuit on behalf of the FCC to shut down Radio Free Brattleboro (107.9) and to seize the 10-watt station's equipment. RFB responded with a filing asking the federal courts to prevent the FCC from shutting down the station until it can have its case heard in the courtroom. *MAINE is getting a New England Cable News bureau, thanks to the purchase of WMTW-TV (Channel 8) by NECN co-owner Hearst Argyle. The bureau at WMTW's downtown Portland studio will be staffed by reporter Kevin Kelley (formerly of crosstown WCSH) and photojournalist Dave Brosemer, who comes to Portland from NECN headquarters in Needham, Mass. *MASSACHUSETTS listeners welcomed a familiar voice back to the airwaves last week. David Brudnoy's still not up to the task of talking for three hours nightly, but he appeared for an hour of his usual WBZ (1030) shift last week to let listeners know that he's regaining his strength and is back in the classroom at Boston University. Brudnoy's been off the air at 'BZ since late September. Another Bay State talk voice has resurfaced: former WBUR "Connection" host Christopher Lydon was filling in last week on Minnesota Public Radio's "Midmorning," and he's rumored to be in the running as the new permanent show host. *Is there any broadcast engineer in southern New England who hasn't known for years about toxic waste issues at the transmitter site of RHODE ISLAND's most powerful AM station? Probably not - at least judging by the number of them who asked us if we were glowing after visiting the site years ago - but that didn't stop the current operators of WALE (990 Greenville) from claiming to have been taken by surprise by environmental issues at the six tower Burrillville site. The Providence Journal reports that Cumbre Communications has filed Chapter 11 bankruptcy to avoid closing on its $2.35 million deal to buy WALE from North American Broadcasting, itself in bankruptcy. Cumbre officials tell the paper that North American concealed the environmental problems at the site, including a $15,000 fine a decade ago for improper storage of hazardous waste. Under a settlement deal, North American will set aside $400,000 of the money it's still owed by Cumbre to be used for cleanup costs at the property. And who's now in control of Cumbre? The company's former president and CEO, Jaime Aguayo, has sold his 79 percent interest in the company to Peter Arpin, whose ADD Media also owns nearby WARL (1320 Attleboro MA). One more problem for North American: the FCC last week upheld a $4,000 fine against its remaining station, KFNX (1100 Cave Creek AZ), for failing to power down from 50 kW to 1 kW at sunset. *Tim Martz is taking aim at CANADA again. Now that he's boosted the power on WRCD (101.5 Canton NY), the border broadcaster is promoting "The Fox" all over Ottawa, including a new Web site at www.byebyechez.com. This isn't the first time Martz has taken a Web snipe at a Canadian rival; his WYUL (94.7 Chateaugay NY) launched "nixthemix.com" to target Montreal's CJFM (95.9) - only to have CJFM owner Standard Radio buy a 25% interest in Martz' radio group. Standard has a reason to take on Ottawa's Rogers-owned CHEZ (106.1), too; in addition to its interest in WRCD, it owns Ottawa rock rival CKQB (106.9). CHCQ (100.1 Belleville) dropped its "Q100 Quinte Country" identity - and its entire airstaff - last week. It's now "Cool 100," still playing country but without jocks for now. Down the road in Cobourg, Don Martin is retiring after 29 years in local radio, 10 of them at CHUC (1450), to join the Northumberland United Way. Over in Peterborough, Kings Kids amends its application for a new 50-watt contemporary Christian station to specify 99.5 instead of 88.7 MHz. 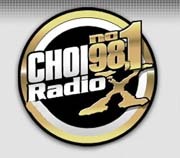 In Quebec, a CRTC hearing on the license renewal of Genex's CHOI (98.1) brought out politicians and listeners - and plenty of strong opinions about the freewheeling modern rock/shock talk station. Quebec City mayor Jean-Paul L'Allier asked the CRTC to silence the station and its outspoken morning team of Jeff Fillion and Andre Arthur, who have been vocal critics of the mayor and of police, calling for a more intensive investigation into a teen prostitution ring that reportedly counted powerful politicians as clients. Meanwhile, fans of the station crowded the hearing room to show their support for the morning show - and the station's owner says he was assaulted by one of the station's critics during a break in the hearing. A correction from last week: we're reminded that while no Quebec broadcaster carries Conan O'Brien's late night talk show, it's still widely available there: satellite subscribers can see the show on other local Canadian stations, it's carried on a national cable network, and of course it can be seen on NBC via WPTZ (Channel 5) down in Plattsburgh, NY. And we'll close by saluting a true local broadcaster: Wayne Harrett not only does the excellent "On the Air in Atlantic Canada" site, he's also the volunteer operator behind CFEP, "94.7 Seaside FM" in Halifax - and when a huge winter storm battered the area, he sprung into duty, making his way to the station and pulling a 7 AM to 9:15 PM airshift, keeping the area informed despite heavy snow and power outages.